Crown Books for Young Readers, 9781984831972, 48pp. 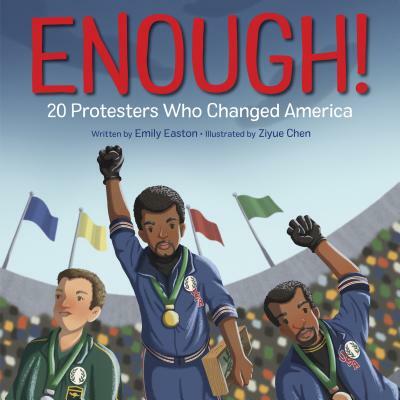 With a foreword from a Parkland shooting survivor, this lushly illustrated picture book introduces young readers to America's most influential protesters--from Harriet Tubman and Martin Luther King Jr. to contemporary groundbreakers like transgender teen Jazz Jennings. Perfect for those not quite ready for Little Leaders and She Persisted. America has been molded and shaped by those who have taken a stand and said they have had enough. In this dynamic picture book, stand alongside the nation's most iconic civil and human rights leaders, whose brave actions rewrote history. Join Samuel Adams as he masterminds the Boston Tea Party, Ruby Bridges on her march to school, Colin Kaepernick as he takes a knee, and the multitude of other American activists whose peaceful protests have ushered in lasting change. With a foreword from a survivor of the Marjory Stoneman Douglas high school shooting, this succinct text paired with striking illustrations is a compelling read-together story for little activists who are just starting to find their voice. Backmatter extends the text with short bios about each protester to provide additional context about their respective movement and the form of protest they used. Emily Easton is the vice president and publisher of Crown Books for Young Readers. While she usually works to create books from the other side of the desk, she was inspired by the activism of the Parkland survivors to write this book in celebration of the people who have stood up to power to help make our country a more perfect union. ENOUGH! PROTESTERS WHO CHANGED AMERICA is her first book. She is also a history buff, avid movie fan, music connoisseur, and all-around pop culture aficionado. Emily lives in New Jersey with her husband. Ziyue (pronounced Zzz yuair) Chen is a graduate of Ringling College of Art and Design in the US and currently lives in Singapore. She has several illustrated picture books to her name, including JUST RIGHT FAMILY: AN ADOPTION STORY, MELA AND THE ELEPHANT, and WHEN I CARRIED YOU IN MY BELLY. She also did the cover art for GIVE PLEASE A CHANCE by Bill O'Reilly and James Patterson. When not painting, Ziyue enjoys reading, sketching, swimming, and spending time with her family and friends.